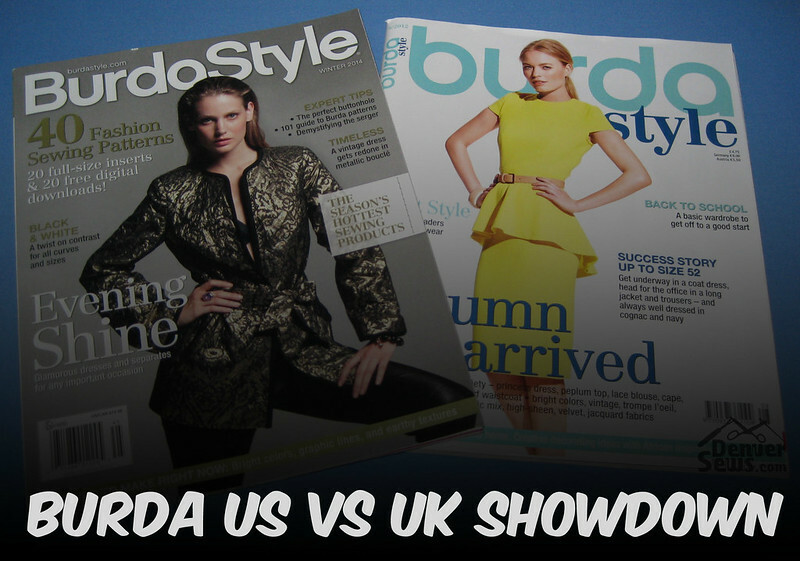 Way back in July, BurdaStyle.com made an announcement that they were working on a release of Burda magazine for the United States. For those of you that aren’t familiar, Burda is a sewing pattern magazine that originates in Germany but is translated to many languages and sold in about 90 countries around the world. A sewing pattern magazine looks kind of like a fashion magazine with spreads of styled photo shoots, but instead of displaying designer clothing the garments are made from patterns which are included in a sheet that you trace from. Note: This is a really long post – if you want the quick summary, scroll to the end for a comparison table. I LOVE pattern magazines because I think they tend to include a wider variety of garments with more interesting details. (Probably because many of them are published every month, while envelope patterns are only released every 3 months or so.) Also, I find the photo shoots more inspiring than Big 4 envelope patterns because they are sewn up in more stylish and RTW looking fabrics. I also find the fit with Burda patterns to be closer to RTW and MUCH more consistent than the Big 4. Previously the US hasn’t had any pattern magazines you could subscribe to locally – all the ones I receive are shipped from overseas, including the English translation of Burda I’ve been getting for the last 4 years. 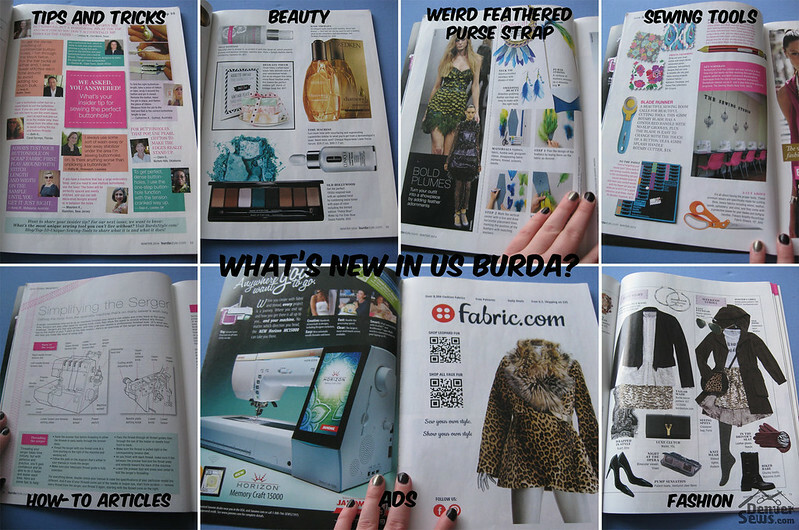 I was THRILLED when I heard Burda was going to be available on US newsstands because it meant that perhaps pattern magazines will finally catch on in the US. In late October, the first edition of US Burda showed up on at my local JoAnn’s. I recognized immediately when flipping through it that I’d seen the patterns before, but I bought it anyways because I wanted to do a thorough comparison with my other issues of UK Burda. FYI, Burda is sold around the world and translated for different countries but the patterns are always the same, so I fully expected the patterns to be repeats of what I already had. Anyone who already subscribes to the UK edition should expect this. The thing that surprised me when I grabbed my stack of UK Burdas for comparison is that the patterns were originally published in fall/winter 2012, a full year ago. Not sure why they chose to use year old patterns instead of more recent ones from the last three months, but since I like these features better than anything in the last few issues of Burda, I’m not complaining. I’m just wondering if they plan to always be publishing a year behind. One thing I notice about these features is that they all are of a similar style – tailored clothing with clean lines and a few modern twists. The fabric choices vary between the features (neon/brights, ethnic prints, black and white, and shiny/sequin special occasion fabrics), but if you look at the design lines I’d say these are all clothes you’d find in the closet of the same person. 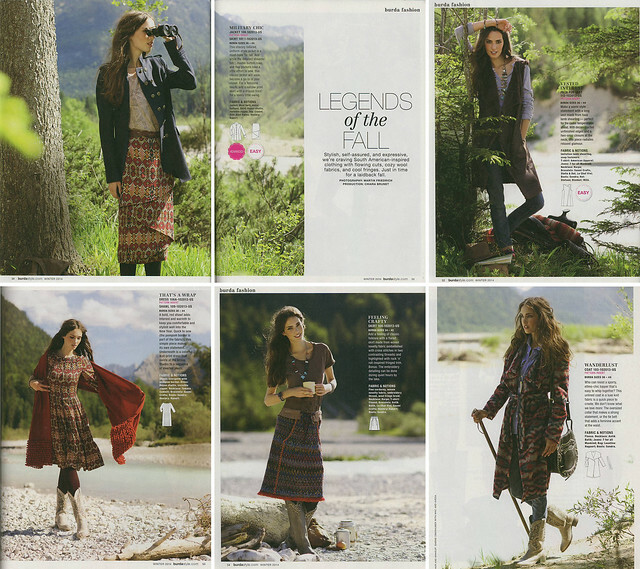 If I flip through my issues of the UK Burda, there is more variety in the styles – I see retro inspired clothes, very feminine clothing with ruching and ruffles, bohemian styles, and so on… There are also occasionally men’s clothes, children’s clothes, and costumes. Now, the features they chose for the US Burda are exactly my style and some of my favorites from the last year, so I’m not complaining! I just want to point out that if those features aren’t your style, the International Burda typically has more variety. Who knows, maybe there will be more variety in the next issue. The US edition is also a bit thicker and glue bound (instead of stapled like the UK version) and all of the pages are printed on a nice glossy paper, including the instruction pages. 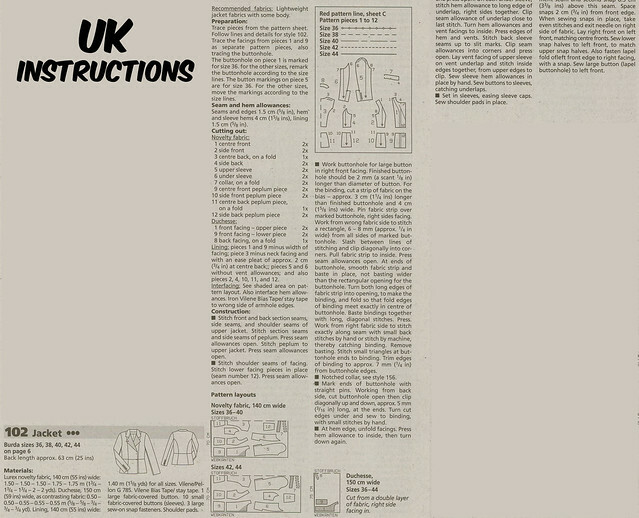 (In the UK edition, the photo pages are glossy, but the instruction pages are printed on newsprint). I like the physical feel of the US edition – it feels more like a proper magazine, and the glue binding gives you a spine with the issue number printed on it so it’s easy to find on a bookshelf. The glue binding also means that the pattern sheets are easier to rip out. Fair warning… while perusing the comments on BurdaStyle.com about this issue, I see that they made several mistakes in calling out which lines to trace for which pattern. If you’re not familiar, the instructions will say something like “Red pattern line, sheet A1, Pattern pieces 1-5” and then you’ll get out the sheet labeled A1 in the corner and look for number “1” in red printed along the edges of the sheet, then trace your finger inward until you find a red line. If the line is actually blue instead of red (as one commenter complained about a pattern they were trying to trace), you will be really confused. Honestly, I can’t think of a WORSE way to confuse a newbie to Burda and turn them off of pattern tracing, so this was really disappointing to hear. The pattern sheet for the international version has all markings (e.g. “center back”) printed in 3-4 languages, so I’m guessing the same sheet is used for all languages and gets a little more proofreading, because I’ve never had this problem with the UK edition. If you’re wondering why the pattern sheets are less crowded, here’s the catch… half of the patterns (20 out of 40 shown in the issue) are NOT on the pattern sheets, but available as a free download online. I checked it out, and the downloads are basically a free pass to the downloads from past issues they generally sell for about $5.99 each. The download has the pattern pieces for just that pattern, and you print at home and tape them together. There is also a print at copy shop full size option if you’d prefer to pay a copy shop to avoid taping. In case you can’t tell from the gif, I hate taping downloadable patterns together! I’ll suffer through it if that’s the only way to buy a pattern, but tracing is SO much faster. Maybe they thought that making the traceable sheets more sparse would be less intimidating to newbies, but to me this defeats the purpose of buying the magazine if I still have to print the pattern I want at home. Trust me – if you have the right tools to trace a pattern, it’s about 10 times faster than taping. 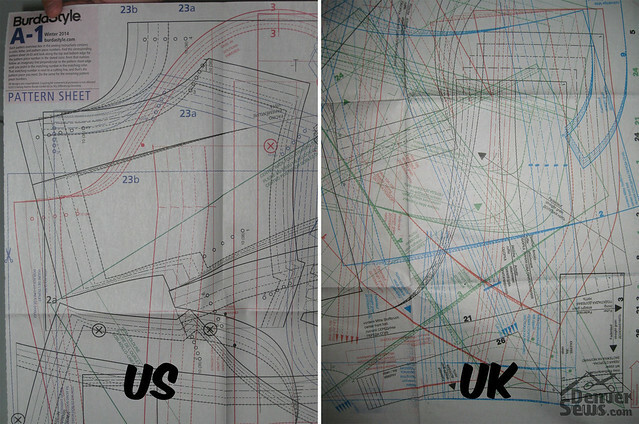 So, I compared the instructions between the US and UK editions for the same pattern, jacket #102. At first glance, the US instructions look longer. 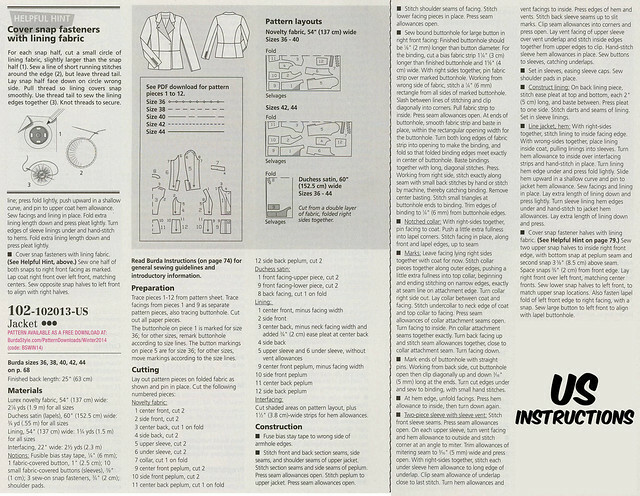 The US edition included a nice little set of instructions on how to cover snaps with lining fabric – awesome! Then I started comparing the instructions word for word… For the most part, the steps are the same word for word, but the US edition has added a few steps including how to turn the notched collar and how to attach the lining which the UK edition did not include. This is great news for beginners who want more detailed instructions! A few things I noticed were sadly missing from the US instructions… The UK instructions included “Recommended fabrics: Lightweight jacket fabrics with some body”, while the US edition only listed the fabric used in the garment in the photo shoot: “Materials: Lurex novelty fabric”. Wow, that is about as useful as saying “something shiny”. Hopefully they correct this oversight in the next issue! 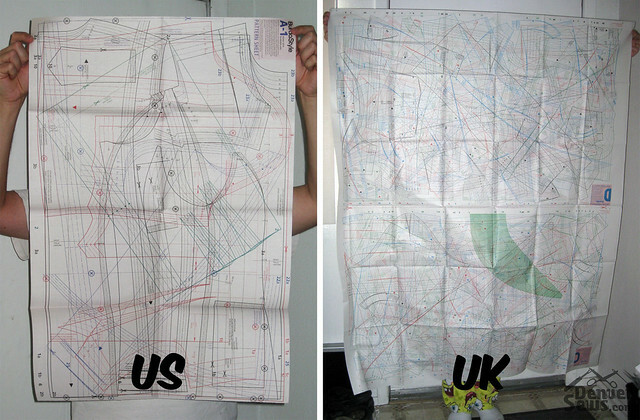 Also, the UK edition had exact yardage requirements for each size, while the US edition just says 2 1/8 yd for all sizes. Not sure why they removed that either. Personally, I’m going to stick with the UK edition through GLP for awhile longer, but I’m hopeful that being able to buy Burda in the US at JoAnn’s and such will make pattern magazines more popular with US sewers. Just a comment regarding “Fair warning… while perusing the comments on BurdaStyle.com about this issue, I see that they made several mistakes in calling out which lines to trace for which pattern”. You simply never had any problems with UK burda style pattern tracing since it is “made in germany” – checked by native speakers yes but still managed “the German way”. That´s why it works and that´s why it´s correct. The US version is made in the USA and I am sorry to say that but I think the way of working in the US is a bit more relaxed. If I buy patterns from Burda (made in Germany/Europe) I never ever had/have any problems, they are correct. Patterns from Vogue, Butterricks, McCalls, Simplicity for example do have little errors – instructions missing, wrong instructions, instructions for a skirt in which not a skirt but trousers are mentioned etc. The worst experience was a Vogue wardrobe pattern with 5 pattern sheets for 5 different pieces of clothing. I naively thought I would have 1 pattern sheet for each peace of clothing. Noooo…………each pattern sheet contained parts of each of the 5 pieces of clothing so I had to make a list to see which parts I had to cut from which pattern sheet for the one pattern I wanted to make. What a nonsense and what a huge amount of non-logic. That is so stupid. I just can´t imagine a person who would do something as stupid as that and then charge a lot of money for it. But Vogue USA can do it. Don´t get me wrong I love Vogue patterns but as I said people seem to have different work ethics and it is just not fair to charge a lot of money for a crappy product. fantastic comparison. thank you. anything about burda kids magazine? Thank you for this. I am pretty much over the assertion that we should just be happy with what we’ve got. Plain and simple the US edition is not a good value. I want to be positive, but I just like the British version so much better. 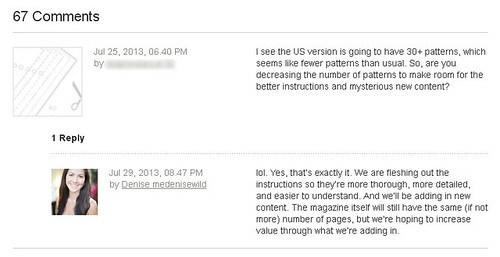 This was so helpful and just what I have been trying to deduce on my own from comments on Burdas website. You really have provided me a great service and savedme some time. Thank you Jamie (isidore) for your thoroughly informative and unbiased blog post. I wish you’d written it (I’d read it) before I subscribed to the US edition in December. I used to buy the monthly Burda in Russia (back in the 90s) and when I moved to the US, I couldn’t find it at any of my local news stands (probably because it wasn’t there? duh). I love Burda because of the quality of their patterns, and I don’t mind a busy pattern sheet, as long as it is accurate. I will buy a subscription to an international edition. Thank you and all other helpful commenters for making up my mind! Thanks for this post. I subscribed to the US edition when it was announced and received the premiere issue. Used to subscribe to the international edition years ago until all that paper started to overwhelm me. No wonder I found no more than a couple of exciting patterns in the US edition. Everything else looked old, and I don’t even have the UK subscription. Now I know why, thanks to you. But the couple of patterns I found to my liking in it are definitely going to be made sometime in 2014 :). 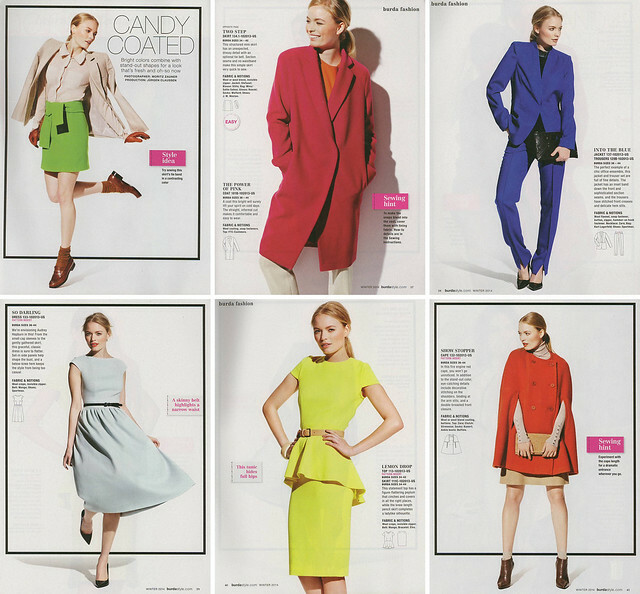 And, kudos to Burda and the US editor (Denise?) for coming up with a US edition. Come next year, I will definitely renew my subscription. Hopefully they’ll get to 2013 patterns in the next issue and you’ll get something you don’t have! I’m a total UK Burda fan. An advantage living in the UK, costwise. But great to see the differences. And, I really like the latest issue of the UK version, very nice. Nice detail. I like the UK version myself. It would be nice to have the UK version more available at stores. My local dealer closed so currently I have no nearby store to purchase. I just wasn’t that impressed with the US version. But, we’ll see what holds for the next issue. Great comprehensive review Jamie – excellently done! 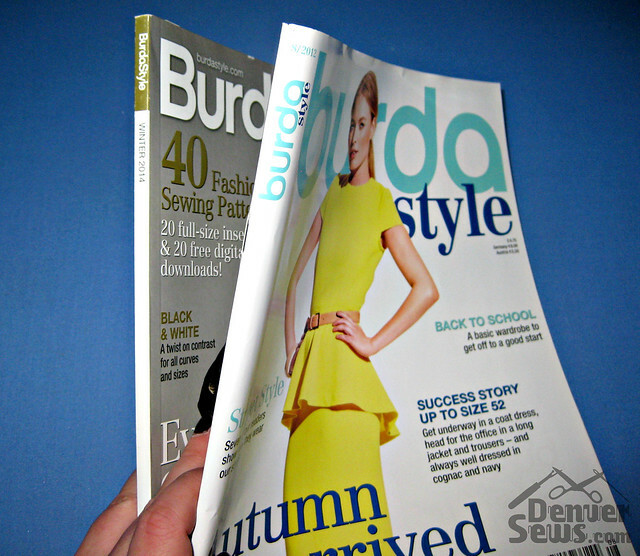 I bought the first US Burda magazine a few months ago but I’ve never subscribed to the UK version. Thanks for pointing out the differences, your post makes it much easier to decide between the two. Awesome review Jamie! It sounds like the US edition is an attempt to introduce the concept of Burda Style to the US market as if we’ve never seen the international version before. Thanks for the photo spreads – now I might actually see if I can get myself a copy!